Sweden is the seventh-richest country in the world in terms of GDP (gross domestic product) per capita and a high standard of living is experienced by its citizens. The economy of Sweden is a developed export-oriented economy aided by timber, hydropower, and iron ore. These constitute the resource base of an economy oriented toward foreign trade. Timber, hydropower and iron ore constitute the resource base of an economy with a heavy emphasis on foreign trade. Sweden's engineering sector accounts for 50% of output and exports, while telecommunications, the automotive industry and the pharmaceutical industries are also of great importance. Sweden is the ninth-largest arms exporter in the world. Agriculture accounts for 2% of GDP and employment. The country ranks among the highest for telephone and Internet access penetration. The top exports of Sweden are refined petroleum, packaged medicaments, vehicle parts, telephones and cars. Main export partners of Sweden are Germany, United States and Norway, Denmark, Belgium-Luxembourg, the United Kingdom. In terms of structure, the Swedish economy is characterized by a large, knowledge-intensive and export-oriented manufacturing sector; an increasing, but comparatively small, business service sector; and by international standards, a large public service sector. Large organisations, both in manufacturing and services, dominate the Swedish economy. High and medium-high technology manufacturing accounts for 9.9% of GDP. 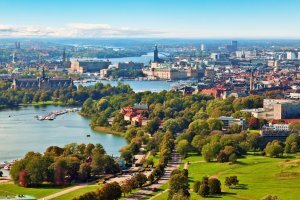 According to various official reports, Sweden is the fourth-most competitive economy in the world, the top performing country in the 2014 and it is ranked fourth in the IMD World Competitiveness Yearbook 2013. Sweden maintains its own currency, the Swedish krona (SEK), a result of the Swedes having rejected the euro in a referendum. The Swedish Riksbank - founded in 1668 and thus the oldest central bank in the world - is currently focusing on price stability with an inflation target of 2%. Sweden imports mainly machinery, petroleum and petroleum products, chemicals, motor vehicles, iron and steel, foodstuffs, clothing, computers. Sweden's main import partners are European Union countries (Germany, Denmark, Netherlands, Finland), Norway and China. Sweden is a Scandinavian country situated in Northern Europe. It borders Norway and Finland, and is connected to Denmark by a bridge-tunnel across the Öresund. 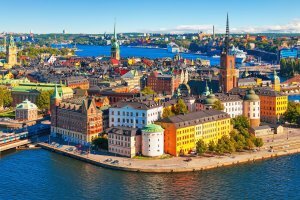 Sweden is a member of the European Union, International Organization for Standardization (ISO), World Trade Organization (WTO), World Customs Organization (WCO) and other international organizations. Sweden is part of the harmonised trade system of the European Union (EU) and importing and exporting are covered by EC Regulations. Since the completion of the internal market, goods can circulate freely between Member States. The Common Customs Tariff (CCT) and applies to the import of goods across the external borders of the EU. The European Community has created the Binding Tariff Information (BTI) system as a tool to obtain the correct tariff classification for goods for import or export. Imports of food and agricultural products from outside the EU covered by the Common Agricultural Policy (CAP goods) are often subject to customs duty and quotas and may require a licence or certificate. Certification, labelling and packaging must meet EU requirements. To reduce the impact on the environment, the EU has required legislation concerning the management of packaging and packaging waste. The CE mark is a mandatory conformity marking for certain products sold within the European Economic Area (EEA). All labelling and information directives of the European Council must be met, as well as local and national regulations. Information on the labelling of products in the interest of consumers and compliance procedures are available at Summaries of EU Legislation. Food information and labelling legislation must comply with EU legislation. Medicines are subject to special labeling requirements determined by Medical Products Agency. For organic produce, EU legislation requires that imported organic food from third countries be produced to the same standards as that from the EU. This may occasionally be requested by the importer. Many importers are authorised to use a Simplified Declaration Procedure (Immediate Release System) and may have special requirements about the presentation of invoice data. Veterinary certificates and/or plant protection certificates are required for agricultural products and foodstuffs. Normal commercial practice. Bill To Order are acceptable. Required for and facilitates customs clearance. Insecticides, fertilisers, additives and other potentially dangerous chemical substances for general sale are restricted by laws. The substances have to be approved and registered with Swedish government agencies after testing to determine whether the product is safe for normal trading.